Hello, friends! Last year, the must have toy of 2016 was the Hatchimal. This year, a must have toy is the Fingerling monkey, sloth or unicorn by WowWee. The monkeys were available this year around August, and they are so, so hard to find in the stores. It's almost impossible to find the unicorn in Toys "R" Us, and I'm sure the sloth will be a hit too. They're so cute. One of the reasons why this toy is so popular is that it's inexpensive. Your child (or you, if you're like me) can have hours of fun with a very cute toy that costs only $14.99 or $16.99, if you happen to find it in stores that don't price-gauge you. Don't pay more than that price for the original Fingerling monkey, it's just not worth it. I personally wouldn't pay over $20 USD for the unicorn or sloth, but I won't judge you toy collectors out there. Once the hype is over, you'll probably be able to find these toys everywhere. As of today, September 25, 2017, you can easily find Fingerling Monkeys at GameStop online. If you sign up for Ebates, you can get money back with a GameStop purchase. I bought our Fingerling monkey from GameStop, in-store, and subsequently ordered two more for my friends online. Remember Furby? Remember Tamagotchi? FurReal pets? Well the Fingerling monkey, sloth or unicorn is like a little interactive pet toy. Phil really likes his teal Fingerling monkey. Her name is Zoe. I told Phil (he's almost four years old) to treat the Fingerling monkey gently, as if it were a real baby. And he's been so, so gentle with Zoe! He takes her everywhere and snaps pictures of her with his camera. It's the cutest thing to watch. Phil's playing with Zoe the monkey as if she were his friend! I have not seen him treat his other toys like so. Granted he has mainly trains and cars, and he likes to crash them or send them to their deaths off imaginary mountains. I love how a toy can bring out love and gentleness in children. And I also like how this toy can keep me, an adult, entertained. Zoe brings back memories of my childhood. We waited in line to get a Furby and we also waited in line to get a Tamagotchi. Ah, those were the days. I haven't been excited about a toy for a while. I'm excited about the WowWee Fingerlings. When Zoe falls asleep, she snores and her eyelids flutter as if she's deep in REM sleep. When she farts, she giggles. And her kisses really warm my heart. She's such a cute toy. I can't wait to get my hands on a sloth or the elusive unicorn. I wish us luck! 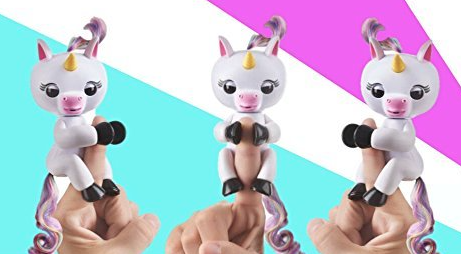 Do you have a Fingerling monkey or unicorn? Or already have your hands on a sloth? What do you think? Just hype, or worth the hype?